wow and they get to keep Destiny. When we first launched our partnership with Activision in 2010, the gaming industry was in a pretty different place. As an independent studio setting out to build a brand new experience, we wanted a partner willing to take a big leap of faith with us. We had a vision for Destiny that we believed in, but to launch a game of that magnitude, we needed the support of an established publishing partner. 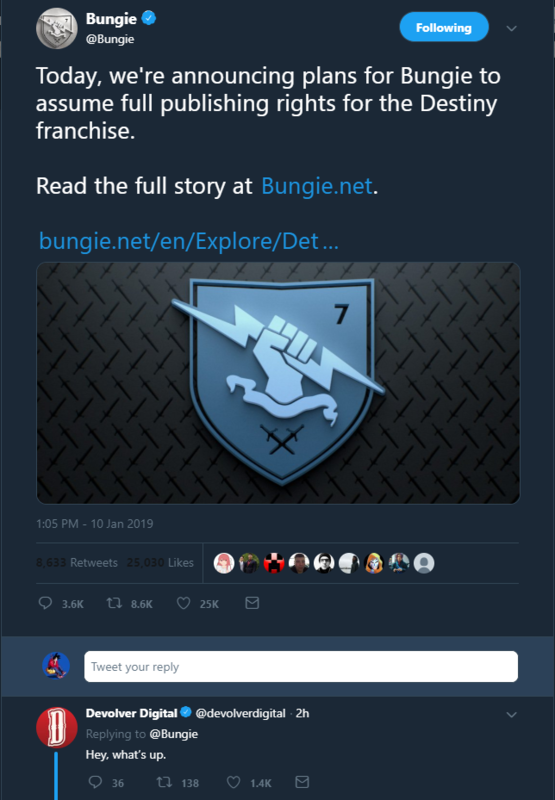 Bungie now only have to deal with being reamed by NetEase. Not that the Halo franchise has much relevance anymore after what was done with 5. Nah, too many Destiny customers on PlayStation for them to walk away from. Will Destiny 2 migrate away from Blizzard Bnet App? Will probably go with stand-alone launcher or Epic one rather than Steam. Destiny is big but I don't think it's big enough on PC to ignore Steam userbase if they walk away from Blizzard's clout. They really should move away from Blizzard / Activision. Neither seems to be on the up anyway. A good clean break would benefit Bungie . Lmao I was thinking this when i heard the news. Bungie didn't learn from Microsoft, not that it was a bad thing from the gamer's perspective really, but Bungie whinged about Microsoft no-end and then turned straight to one of the industry's over-bearing publishers. They'll be back in bed with another publisher soon enough that they can blame all their shortcomings on. I highly doubt that. They may enter into publishing agreements, but their name and successes with Destiny despite Acti's "disappointment" with sales numbers means that they should be able to secure funding moving forward with little trouble. Who knows what directly they'll take the game without the need to keep shareholders expectations met. Could be what is needed to take the series to the next level. Also "their shortcomings" assumes that they big decisions were Bungies to make, and I expect that is not the case. The product would have been forced into a shape Acti wanted which is possibly quite different than what Bungie wanted to release. I don't think it fair to judge them when anything they produced was not under their complete control. now we get to wait and see how much of the horrible decisions were Bungie's work or Activision's. how many more MT's can they stuff into Destiny?, can they release a game without having people buying trash DLC packs?. or will they prove that all the missteps and screw up's were entirely Activision pushing them in for investor numbers? it will be interesting to see if they can regain any of the faith they lost from players during the last 2+ years. Scheriers book has a great article about Bungie imo. They should bring back Myth, i liked that game. pretty sure i still have my ps2 copy of this somewhere. This is potentially the greatest thing ever for Destiny, as long as having no Acti deadlines means big content droughts...hopefully not though. BioWare did the same thing, taking the Mass Effect, KOTOR and Dragon Age ips with them (they can leave Anthem on the sacrificial alter lol)...then re-hired Drew K.
I know this isn't going to happen, but I'm just imagining how amazing that would feel (I'm a masochist, obviously). BioWare is gone. ALL of the people that made the games you like are gone. It's just a name now. Let it go. We have Obsidian, Larian, and CDPR to carry on their noble goal before they lost their way. It is a sad day when you see your heroes fall. This must have been what the 13 Colonies felt when they discovered Benedict Arnolds betrayal. Heck, this may hurt even more. Don't forget InXile Entertainment, i know you don't like Fargo, but i still have hope for their games..enjoying playing through the Bards tale trilogy atm. You're so right about the future being bright though: we have Cyberpunk 2077, The Outer Worlds and a new game (please be DOS3) from Larian in development; heaven, absolute heaven. The real difference for me, especially with RPGs like the above devs work, is in the little details, and the way things are written/narrated within the game. You really notice when love has been poured into a RPG these days too: with DOS2, I wonder how much Kevin VanOrd's writing was a creative guiding light for the whimsical parts of the game...you can picture him writing the exquisitely detailed item descriptions and little book entries in the game (some of my biggest lols are here). I always enjoyed his reviews on Gamespot, all those old school RPG ones when him and Gertzman alternated turns...the glory Gamespot years now filtered down into amazing RPG writing and characterisation at one of the best devs in the world: so good. Brilliant time to be a RPG fan bro, great times.